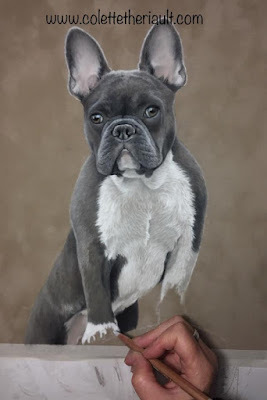 I have been working on this dog portrait for a fair bit now and I will soon be adding the backdrop once the feet are done. I love using soft pastels on this velour panel because I can achieve the softness of the fur quite nicely. I hope you will keep on following to see how this little fella turned out! Oh my goodness Colette!!! Fabulous portrait!!!!! I can almost feel his smooth coat..
Hilda, you are so kind, as always! Thank you; glad you like him!